Being a “Yes Man” isn’t always a bad thing. I know it came out a few years ago, but we only recently saw the movie Yes Man. The premise of the story is that a guy who normally said no to everything was going to say “yes!” to every opportunity that presented itself, and his entire life turns around for the better. I thought it was uncomfortably funny, but Handsome Hubby took a detour off of Sophomoric Humor Lane and actually found something thought provoking. What was the lesson that has stayed with him? To say “yes” more often when the boys ask him to do something with them… Grant in particular. 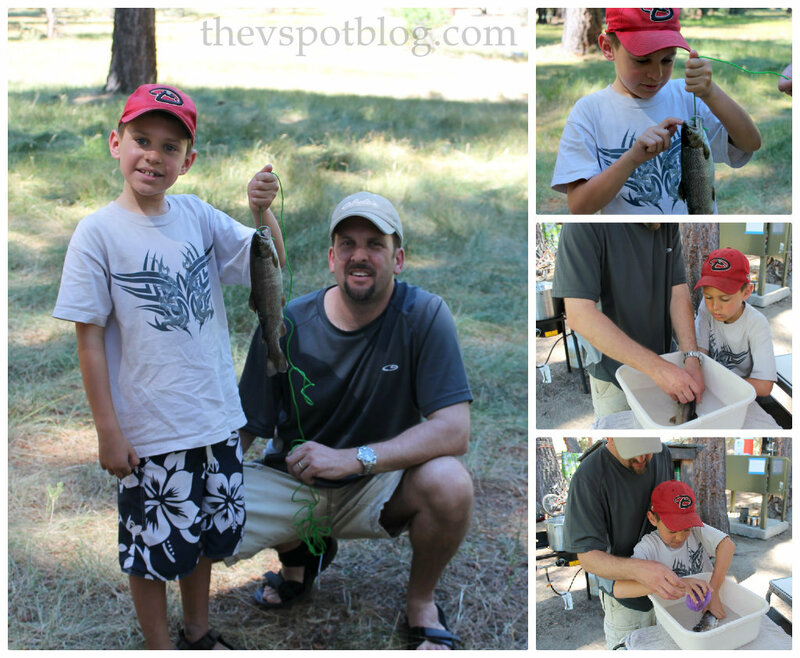 Last week while camping, Grant wanted to go fishing. HH took him and let him pick the spot. Grant wanted to fish from a wooden bridge because it certainly looked the part. (God bless his little romantic soul.) HH told him that it was actually a bad place to fish, but Grant insisted. How an 8 year old has a Norman Rockwell image in his mind, I don’t know, but HH set him up to fish there. HH waited patiently for 2 hours while Grant got the Norman Rockwell Ideal Fishing Images out of his head. The child did not catch a single fish from that bridge (not even a nibble), but HH let him stay there until he was ready to move on. Which eventually they did, AND Grant caught a fish, AND he learned how to clean it. Even as amazing as it was to catch a fish and let Dad teach him how to clean it, I think that Grant will remember the experience of fishing from that bridge more than he will remember actually catching the fish. HH shared this Yes Dad epiphany with one of his friends, who mentally digested it a few days and then implemented it with one of his daughters. The following was a text exchange between them. Friend: Hey pal, having date night w my 5 y.o. girl and saying yes to every ridiculous request…thsnks for the tip. HH: Sounds awesome. Hope you truly enjoy it. I work really hard to be a Yes mom. There are some things that are so small that you can say Yes to and it makes the kids’ day. great great post and I’ll check out that movie. I am with Vanessa. My goal for this summer was to be much more of a Yes mom. I did a lot more yessing that I have done in years past. I definitely improved a lot! I didn’t take on contract work this summer, and I really enjoyed my kids in the summertime far more than I have in the past. I did however still have to keep up the other part of my business. That is something I will always feel torn with. It is so integral to me being me to paint and create, but I can’t seem to find the right balance between being the Yes mom and keeping myself sane with my own work. This post is a great reminder to try to have far more Yesses than No’s. With that in mind, I am going to bed, so I will have energy to say Yes to all those kid requests tomorrow. How a tablet made my kid cry. In a good way.